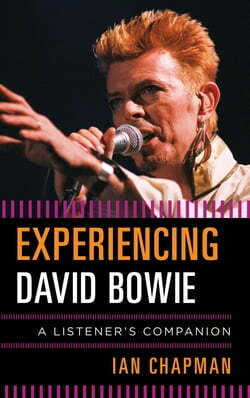 In Experiencing David Bowie: A Listener's Companion, musicologist, writer, and musician Ian Chapman unravels the extraordinary marriage of sound and visual effect that lies at the heart of the work of one of the most complex and enduring performers in popular music. Still active in a career now well... read more into its fifth decade, Bowie’s influence on music and popular culture is vast. At the height of the “glam rock” era, Bowie stood head and shoulders above his peers. His influence, however, would extend far beyond glam through successive changes of musical style and stage work that impacted upon wider popular culture through fashion, film, gender studies, theatre, and performing arts. As Chapman suggests, Bowie recognized early on that in a post-war consumer culture that continued the cross-pollination of media platforms, the line between musician and actor was an ever-thinning one. Opposing romantic notions of authenticity in rock, Bowie wore many faces, challenging listeners who consider his large body of work with a bewildering array of musical styles, covering everything from classic vaudeville to heavy metal, glam rock to soul and funk, electronic music to popular disco. In Experiencing David Bowie, Chapman serves as tour guide through this vast musical landscape, tracing his development as a musical artist through twenty-seven studio albums he generated. Pivotal songs anchor Chapman’s no-nonsense look at Bowie’s work, alerting listeners to his innovations as composer and performer. Moreover, through a close look at Bowie's “visuals”—in particular his album covers, Chapman draws the lines of connection between Bowie the musician and Bowie the visual stage artist, illuminating the broad nature of his art. This work will appeal to not only fans of David Bowie, but anyone interested in the history of modern popular music, fashion, stage and cinema, and modern art.